A few weeks ago a Twitter follower, Maria, asked me about a seriously twisted Philly killer. At the time I told her I’d be getting to him in a few episodes, ‘case there’s more twisted and nefarious goings on in Philly besides murder. Well, I hope she feels it was worth the wait. This is the episode where we talk about the twisted old man who lived in the shoe. 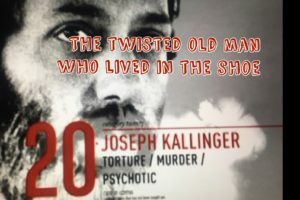 Some call him the cobbler, some call him the shoemaker, I call him one seriously twisted, creepy, disturbing, deluded individual – Joseph Kallinger.